Today’s tablets and phones have all the processing power you need for creating incredible movies, on the go. 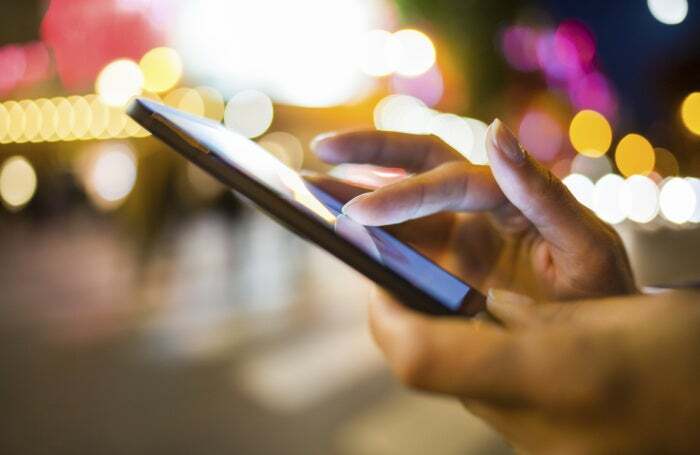 Here are three apps that can help. 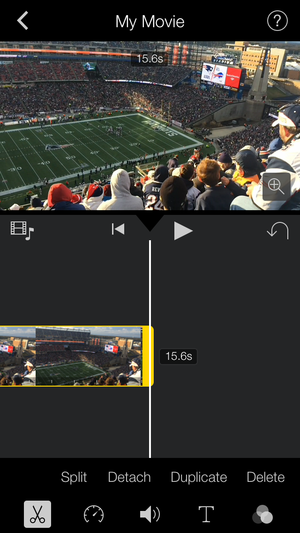 iMovie makes the most of a small screen, allowing you to trim video clips easily. Apple’s $5 iOS video editing app is both slick and simple. It lets you create movies from your own videos and photos stored on your device, or transform them into a Hollywood-style movie trailer. iMovie is (mostly) easy to use, and it helps you create professional-looking results with just a few taps of the screen. The interface is mostly intuitive, though I had to search the Web for help on a few points, such as how to split a video clip—which was very easy to do once Google pointed me in the right direction. You also can add audio tracks to your movies, or record new audio files if necessary. Creating a Trailer is slightly more time-consuming, but not any more difficult. iMovie’s wizard walks you through the whole process, from adding cast members and video clips to guiding you through the shots that make it look like the work of a pro. iMovie takes up a lot of space on your device—704MB on my iPhone—and it is taxing on your phone, so you may notice it running slowly at times. But that’s a small price to pay for a pretty slick video editing tool. VidTrim’s interface is a bit bland, but for the most part, the app is easy enough to use. VidTrim’s name offers a pretty good hint at what this Android app does: trim video. Luckily, that’s not all it does–it also allows you to grab frames, change the resolution, apply some basic effects and more–but it’s not the most elegant video editor I’ve ever seen. VidTrim is available in a free, but ad-supported version, as well as a $2.70 Pro version. Those ads are annoying: I accidentally tapped them more than once, thinking they would direct me to features in the app itself. It’s an easy mistake to make, because the ads stand out against VidTrim’s bland interface, which features simple icons directing you to its features. Once you skirt the ads, you can use these icons to trim, transcode video to another resolution (up to 720p on the free version, 1080p on Pro), merge files, grab frames, save as an MP3, rotate, and apply various effects, such as black and white or blurred filters. Using all of these features is easy, but I didn’t like how VidTrim bumped me back to the main menu–rather than back to the page offering all of the effects–every time I finished using one. I also don’t like how the free version saves your output with a watermark. It means updating to the Pro version is a necessity for anyone who’d like to produce a video that can be shared in a professional setting. Still, $2.70 isn’t terribly expensive, and VidTrim covers the basics of video editing. Adobe Voice offers tips on how to organize your content when creating animated stories. Adobe Voice's tagline says it can help you “show your story,” and it’s an apt description of what this iPad app does. What it’s not is a typical video editing app; in fact, Adobe Voice is not really a video editing app at all. But it’s worth including in this roundup because it does let you create professional, elegant videos that are perfect for use in various business settings. 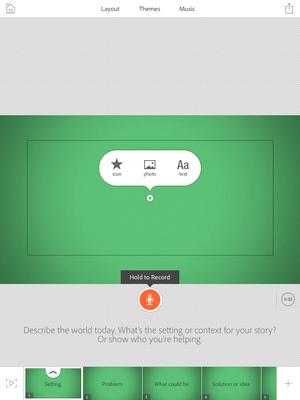 Adobe Voice lets you create “stories,” which are told via animated videos. And while calling these “animated videos” is simply a fancy way of saying “slideshows,” these are not your average slideshows. Adobe Voice guides you through the process of creating your slideshow, from helping you pick a title to structuring its contents. Stories are organized into pages. Each page features audio that you record, which makes this a useful tool for creating presentations, marketing videos, and more. Adobe Voice adds background music to your audio, which goes a long way toward making the end result more pleasant. You then complete the page by adding icons, photos, or text. You can choose from the app’s incredibly extensive library of icons and photos, or you can upload your own. Once your video slideshow is complete, it can be shared via social media or email. You will need to sign in to the app in order to share videos, which can be done using an Adobe Creative Cloud account or Facebook sign-in. You also can save video files directly to your iPad’s camera roll. Adobe Voice features lovely layout, making it as easy to look at as it is to use. And it’s free. What’s not to like?